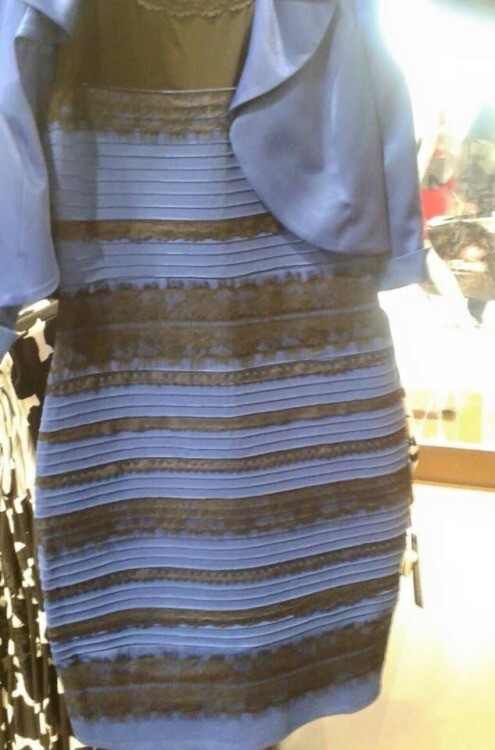 The internet has exploded over the colours of this dress. The question is - do you see WHITE and GOLD or BLACK and BLUE? Everyone has been debating about the colours ever since it appeared in Tumblr, when a blogger's friends couldn't decide what colours they were. The image has since gone viral with people commenting on every social media platform and sharing what they see. Even celebrities such as Kayne West and Justin Bieber have declared whether they are Team White and Gold or Team Black and Blue. We had been discussing it this morning at Free Stuff World, with the team completely divided. We've since learnt the dress is actually black and blue (it can be bought online) and our designer even used Adobe Photoshop to confirm what colours were identified. So why are people seeing white and gold? It doesn't mean you are colour blind. It is infact all about light! This means your brain and eyes are deciding what to see, so your brain may decide to discount the blue side which means you'll see white and gold. Or you brain might decide it ignore the gold side and therefore you'll see black and blue. Well I'm glad that's all cleared up - and for the record, I see BLACK AND BLUE!